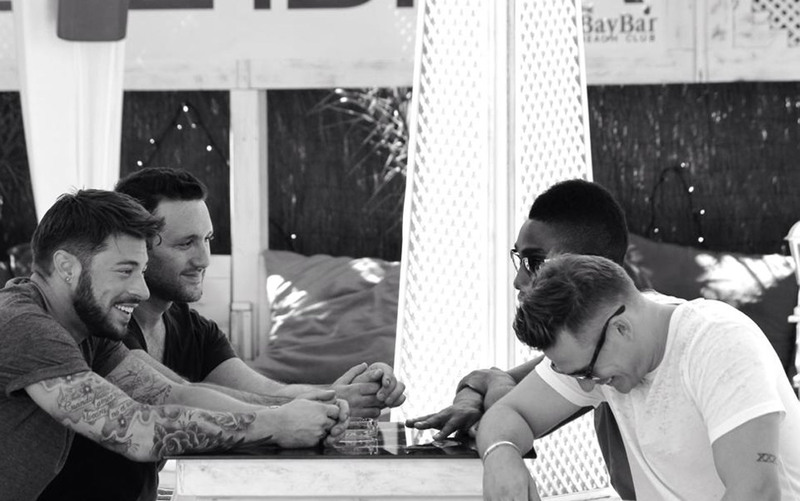 English R&B group Blue are in sunny Ibiza right now. The members consist of Lee Ryan, Antony Costa, Duncan James and Simon Webbe. The band burst into superstardom in 2000 with their singles, All Rise, One Love, Guilty and have worked alongside Elton John, Stevie Wonder and Lil Kim to name a few. Upcoming new ITV2 reality show sees Blue running a bar in Ibiza, bringing in the punters. Baybar is a popular beach lounge, bar and restaurant situated in San Antonio. Here we talk to Lee from the band about their new show, antics and thoughts on the party island. SV: Hi Blue! How are you finding Ibiza so far? We are loving Ibiza! It’s a beautiful place that has so much to offer. The people here are so fun to be around; you cannot help but smile whilst you are here. SV: Can you tell us a bit about the new show? The show follows myself and the boys as we embark on our newest journey, opening a bar in Ibiza. You will get to see the triumphs and the tribulations, laughter and possibility tears as we try to make the bar a success. SV: Have any of you worked in a bar before? This is a new experience for Blue. It will make for some great entertainment… We hope. SV: What are the most difficult and easiest tasks of running a bar? We love to socialize so the easiest task is keeping those in the bar happy. Making friends has never been difficult for us but the most difficult is when things go wrong in the bar. It’s not an easy job to do and we are appreciative of any advice that we are given. SV: Aside from the new show, what else have you been doing lately? Simon has just announced he’s doing Strictly Come Dancing, Ant is spending as much time as he can with baby Savannah, and all us boys are back in the studio writing. It’s going to be an exciting rest of the year for Blue. SV: What are your thoughts on Ibiza? It’s a great place; we’ve had such an amazing time out here. Thank you to everyone out here that has made our time so special! SV: Have you been to any of the big clubs yet, or plan to? Not yet, there hasn’t been time. Our focus is on the bar at the moment and we want it to be a success. Its long hours and tough work, but it’s going to be worth it. SV: Finally, what can we look forward to seeing from the band in the near future? Stay tuned… We have some exciting plans ahead. For now we are focusing on the bar and then the boys will behind our boy Simon as he starts on Strictly Come Dancing. So everyone, if you want to see Blue in action, get down to Baybar now! Next articleIbiza Romans vs Carthaginians; What to Expect & What it is all About.